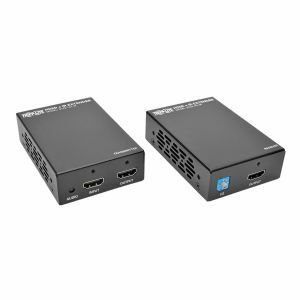 The B126-1A1-IR HDMI over Cat5/6 Active Extender Kit includes a transmitter unit and a receiver unit that work in tandem to extend HDMI audio/video and IR remote control signals to a projector, monitor or television. The kit is ideal for digital signs, trade shows, classrooms, churches, offices, retail settings and other applications where the source is located farther than conventional cables allow. HDMI cable (see Tripp Lite's P569-Series) connects a local display and the audio/video source to the transmitter unit and a remote display to the receiver unit. Cat5e/6 cable connects the two units (for best results, use 24 AWG solid-wire Cat5e/6 cable, such as Tripp Lite's N202-Series). Included IR-IN and IR-OUT cables allow you to control the video source, such as a Blu-ray player, while standing at the remote display. The B126-1A1-IR can extend a 1080p (60 Hz) signal up to 125 feet. In addition to crystal-clear video, the B126-1A1-IR delivers full, rich stereo and 7.1-channel surround sound (multi-channel or PCM) audio. Built-in equalization control lets you fine-tune the image quality at each remote display. Supports 24-bit True Color (8 bits per channel) and HDCP. Easy to set up with no software or drivers to install. Mounts to a wall, rack or pole using the included hardware.